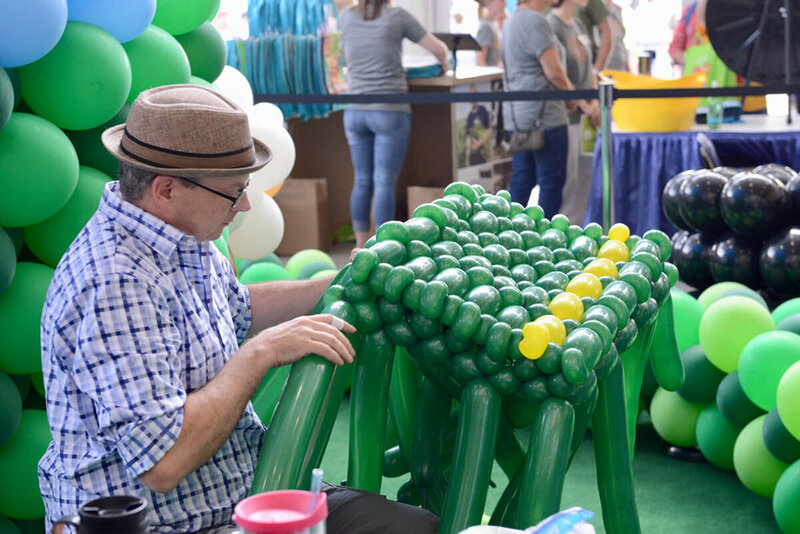 John and Johnna Perry of Kansas City, Missouri, are world record holders in the balloon sculpture field and have brought their talents center stage at the Iowa State Fair with the Iowa Food & Family Project. Learn more about the Perry’s, their art and what you can expect to see when you stop by the exhibit in the south atrium of the Varied Industries Building! What’s going on with the sculpture here today, and what do you expect it to look like at the end of the fair? John: There will be a total 23,749 balloons – give or take. It will be complete at 5 p.m. on the final day of the fair (Sunday, Aug. 20). Essentially, all available floor space will be filled. To make it move, we have a turntable motor. The motor itself was purchased from a gentleman in Utah who specializes in making motors for motion displays. We work with him to build a motor that fits our needs for a particular exhibit. We had to design the turntable itself and other structural pieces. 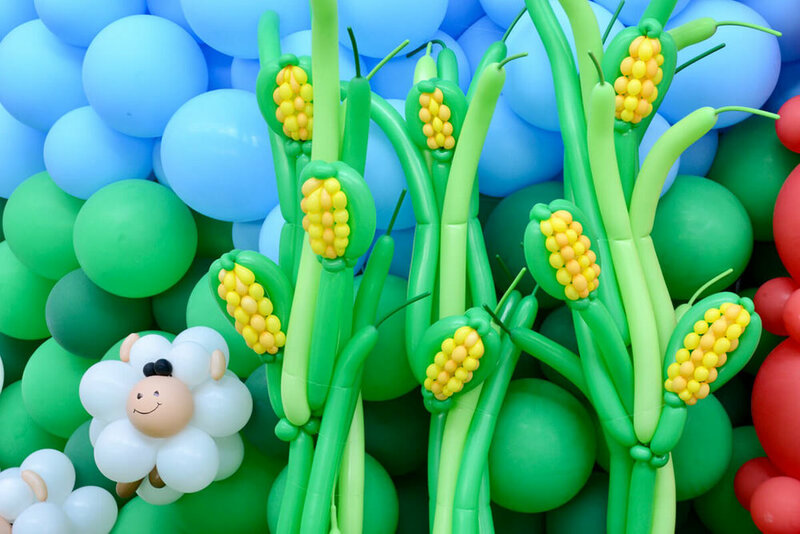 The balloons themselves weigh next to nothing – 100 balloons weigh about a pound. As of August 16, there are about 230 pounds of balloons used total and we have 400 pounds with us. They weigh remarkably little for the space they occupy. How does one become a balloon sculptor? We started small, but we decorated our wedding reception in a pretty unconventional way with balloons. Somebody asked there if we would create balloons for an event they were having, so it became an unintentional business. How does this sculpture compare to your other work, and what has been the most challenging? John: No two days are the same in our work. This is the first large-scale sculpture we’ve built that rotates in its entirety. Most often, large sculptures will have a static backdrop. This one is different because it is viewable all the way around. We like to incorporate movement into our sculptures. I don’t think people picture balloons and motion going together. I feel like our challenges change every day. We never replicate a sculpture in totality. We started here 12 years ago with the “American Gothic” scene. We’ve built a farm before – it is not this farm. It is important to us to make each sculpture unique because otherwise, that would transition us from artists into crafters. For example, here we were asked to make farmed turkeys, which is not something we were familiar with. I don’t think we even had an idea of what a farmed turkey looked like. I’ll also say, we never miss an opportunity to go to an art museum. Seeing artwork in other mediums is always a great inspiration. What has been the crowd’s reaction as the sculpture has taken shape? John: The crowd is fun here. They ask what we’re making now; I see families playing “I-spy.” We’ve heard a lot of people loving the corn, which makes sense considering we’re in Iowa. Our personal favorite pieces depend on what we’re working on too. Today, my favorite is probably the pigs. Johnna: And mine is the soybeans! Our art is incredibly accessible, and people respond to it because they have some sort of relationship with balloons – most people have had a balloon or tried to make a balloon animal themselves. People can look at it and relate to it. Sometimes with fine art or art museums, there’s a barrier. People aren’t sure how they can interact with it and think they need to know something about interpreting it. It doesn’t have to be the case with art at all. What do you love about the Iowa State Fair?